Palmilla in La Quinta, CA. Palmilla is a very unique development in La Quinta. Built by RJT Homes in 2004-2006, these contemporary homes won the “Best in American Living” award by the National Association. of Home Builders, as well as the 2005 Honor Award for Design. Showcase homes (designed by Downing, Thorpe and James), surround eight acres of shimmering lakes meandering through the 72 acre development. Palmilla features original metal sculptures, and lush desert landscaping, as well as an ideal location right off of Jefferson St. This stunning development is a stand out amongst La Quinta’s non-golf course communities. Approximately 20 minutes from Interstate 10, and only across the street from the Grocery Store and restaurants, Palmilla is easily accessible. Palmilla is a 24 hr. guard gated community. The landscape was thoughtfully laid out to preserve the natural desert with water-wise plants, trees and shrubs. Located within the IID (Imperial Irrigation District) so your electrical bill will be provided at lower rates, Palmilla offers a water front serenity which is a lovely contrast to the hot desert sun. Probably the most captivating part of Palmilla, besides the Lakes, is the artwork. 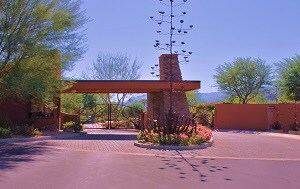 An “Art Garden” at the front entry, as well as the handcrafted gates and street signs were created by famed Southwest sculptor, Joe Tyler, who took his inspiration from the Sonoran desert. Truly unique and special..Palmilla is not easily forgotten. Palmilla offers single family residences only. Homes range in size from approximately 2400 sf to approximately 4500 sf. Contemporary in design, with beautifully appointed chefs’ kitchens, step down formal dining rooms and conversation areas, the designs are free flowing and open. Floor to Ceiling pocket doors-many wrap around entire corners of the homes, truly bring the outdoor in. Location: Entry is on 50th just off of Jefferson St. Recent Home Values: Approx. $600,000 to $1,300,000. Golf: No golf course, but about 5 minutes from Silver Rock and adjacent to The Citrus. People that enjoy Palmilla also tend to like the communities of Haciendas At La Quinta, Talante, and The Estancias At Rancho La Quinta.